As usual, the race will be decided on the run. Therefore, I’ve done some extended analysis on the athlete’s run performance. It will be no surprise that the athletes with the best odds (Crowie and Rinnie) are also the best runners in the field. Here is a closer look at the data on athlete’s running strengths. Looking at the individual run results, I’ve come up with some rating-like assessment of athlete’s run leg during an Ironman triathlon. The following tables list the main contenders and some other athletes that might be in a good position during the race. By all numbers, Crowie is the strongest runner in the field. It remains to be seen if Macca’s Olympic training has given him an extra edge – I’m sure that he believes he can beat Crowie on the run. On the women’s side, the numbers show that Rinnie is by far the best runner in the field. There are a few athletes that have a better potential than the average numbers indicate – Caroline Steffen, Bek Keat and Leanda Cave come to mind. If I take the predicted finish time (based on the ratings and the Kona course rating) and the run times (I’m using the lower of the average and Kona Run times), I can speculate on the standing before the run. Of course, this is just playing with the numbers and does not take real race dynamics into account, but I think some speculation is still interesting. On the women’s side, my numbers predict Amy Marsh leading off the bike. The real story, however, will be how far back Rinnie is going to be (I have her 13 minutes behind and not even in the TOP10 after the bike) and how far ahead of her Caroline Steffen is going to be. 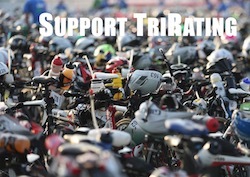 If it’s really going to be 8 minutes, Rinnie has to come up with one of her best runs in order to win again in Kona. Also, one of the other girls should be able to come up with a run a bit better than her Run Rating – maybe Mary Beth (being a bit more rested this year), Rachel or Leanda. I think that the race will be decided after the Energy Lab – maybe we’ll have a female version of Mark Allen running down Thomas Hellriegel from 1995 (he was 13 minutes after the bike). 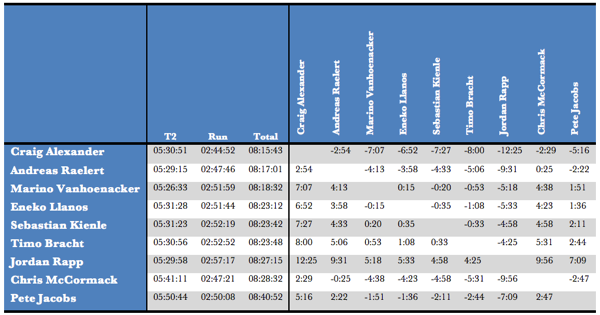 The following tables show the projected time after T2, the Run Rating and the total finishing time. In a row, a positive number means that the athlete has to be ahead of the other athlete, a negative number that he can afford to be behind. This table also shows that if Macca or Pete Jacobs make it into T2 close to the front group, they have a good chance for a podium spot or even winning the race. Again, it is amazing to see how better Rinnie’s Run Rating is compared to the rest of the field. Based on the numbers, she can give up more than 15 minutes to everyone! As noted earlier, this number may be a bit misleading. The rest of the field is much closer together, and a lot will ride on who’s having a good day in the Kona heat.